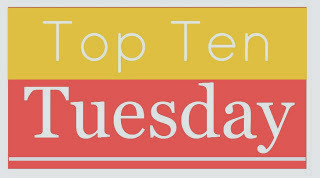 To learn more about Top Ten Tuesday or see the future topics, click here! The Lost Sisterhood by Anne Fortier: I LOVED Juliet and I'm so excited that she has a new book coming out!! The Winner's Curse by Marie Rutkoski: I cannot wait to read this! And the cover is so pretty! Anna Karenina by Leo Tolstoy: I will read this book this winter. I started it a few years ago but put it down for another book...and never picked it back up. Rose Under Fire by Elizabeth Wein: Got this from the library but was super busy the week and came in and had to return it before finishing. Just One Year by Gayle Forman: I've been looking forward to reading this and still haven't gotten a chance to pick up a copy! I've been slacking. The Tea Rose by Jennifer Donnelly: This is one of those books that has been sitting on my bookshelf unread for too long. American Gods by Neil Gaiman: The only Neil Gaiman book I've read was The Graveyard Book and really want to read another one of his books. What books are on YOUR to be read list this Winter? Have you read any of ours? Nice lists! Jen's picks look like mine - books I've been meaning to read forever but haven't gotten to yet. I will end up reading THE WINNER'S CURSE, though - that looks great! I'm afraid that I haven't read any of the titles in your list but I would love to read Anna Karenina and American Gods. :) It is so apt that I was just compiling 10 books that I should have read a long time ago and it ties so nicely with this week's TTT theme. I love your guys' TBR lists! Good luck with Anna Karenina, Jen! American Gods was my very first Gaiman book! He lets his weird out a little bit more in his adult books than his YA ones, but otherwise very similar in style and tone. I hope you enjoy it as much as I did! I hope you enjoy Rose Under Fire, I loved it and would like read more of her books. Here are my top ten books! Great post, girls! Can't wait for Taste of Darkness either! I've had Neil Gaiman's American Goods on my list awhile now. Didn't make the cut for winter, maybe SPring? I haven't had a chance to read Taste Of Darkness, but I'm really looking forward to reading that whole series! I'm also looking forward to Side Effects May Vary. Great picks this week! I really like your list! If you like Maria V. Snyder, have you read her Poison Study books? This was a fun theme to pick some books for- I enjoyed it! Great picks! I am currently reading Just One Year and it is pretty good. The Winner's Curse is one I'd really like to read as well. Great list! He didn't make my winter list, but I really need to read me some Neil Gamon this year. I read Anna Karenina last year. Good luck with that one; it's a hard read. I am glad I got through it, though. For bragging rights, if nothing else. :D HappyTuesday! Yes! I too am super excited about The Winner's Curse. And also Rose Under Fire but I'm worried about the ensuing tears. The Lost Sisterhood and Rose Under Fire look amazing. I'll need to add them to my wish list. People either love or hate American Gods so I hope you love it! You should also try Neverwhere by Neil Gaiman. It's my favorite by him! And if you like audio, Neil Gaiman also narrates it! I'm looking forward to The Winner's Circle, too! American Gods is good, but very different from The Graveyard Book. This makes me so excited about deciding what to read in my free time at winter break! Nice choices! I'm a bit late to the party today -- my post went up at midnight, but I didn't get my link up until this evening. I need to try some Maria Snyder, and I loved Gaiman's Stardust but need to read some of his other work. I've got a mix of already-published and coming-in-January-or-February titles on my TTT list. Wow! So many people with lots to read! Love the Top Ten Tuesday, thanks for putting it together. I hope you enjoy American Gods! I did, but liked Anansi Boys even better. I cannot wait for Winter Break from college so I can just start reading all the time! I want to read Anna Karenina so badly. I absolutely loved the movie and the way it was filmed! I need to read all these books! I haven't been reading lately! This is good motivation! American Gods is so good! Especially if you enjoy different mythologies. It does take a bit to get into it though. Good luck! Thanks again for the opportunity to find other blogs and, most of all, books. Help I'm starting a book club?